Everybody mounts the bottom of the case to the racks. I mounted the case top to the rack. Made a restraint so the case only opens about 75 deg. Easier to pack into the semi-horizontal bottom and then close the case. Some reusable shopping bags are close enough in size to make good bag liners for the Pelican 1500s. Hola. I mounted a set of Sea Horse boxes on the stock frame too. I used big fender washers under the bolt heads to spread the load. I was going to make them removable so I bent some strap so the bottom bit hooked over the factory frame. Since I don't' take them off I cut the handles off so I had a larger flat surface on top. Sure beats the price of Pelican stuff. I checked out the ones at HFT this weekend - not quite as big as I'd hoped, so I'm comparing the #'s to make sure I'm properly calibrated. Harbor Freight 3800 Watertight Protective Case - 16-5/16 In. Inside Length (in.) 14-15/16 in. Inside Height (in.) 6-11/16 in. Inside Width (in.) 10-9/16 in. - a little over 3" longer, well over 2" taller and similar in depth to the HFT model. - slightly less dust resistant, if that matters. Last edited by roostabunny; 03-12-2018 at 03:34 PM. Edit: For reference, a Pelican 1400 is similar in size to the HFT case, but is tested to IP67 (Dust Proof, submersible to 1M for 30 minutes) and costs about $73. I had my MCM Electronics cases that are probably the exact same case as the Sam's Club one and had no problem riding in the rain. No leakage whatsoever. RCnNC has tons of miles on his and I doubt his have leaked either. BTW, you don't need a Sam's Club membership to buy these. Go to your local Sam's and they'll give you a guest pass. Might be 10%, but that's not much when they are so cheap already. The side cases have never leaked, in spite of the numerous holes in them from the various mounting systems I've installed. I was going to buy a new set for the latest attachment system, but eventually figured "why? ", and kept the old ones. As far as using a fender washer inside my cases, I didn't. I used a finish washer which makes for a clean install; plus, the inside of my cases have a 1/4" sheet of ABS on the side that attaches to the bike, to strengthen the case. My top case did leak once. The rubber gasket had started to deteriorate a little in one of the corners. I fixed it with a piece of nylon rope and some outdoor silicone caulk. I picked these up at a swap meet last year, but never did anything with them (see below). 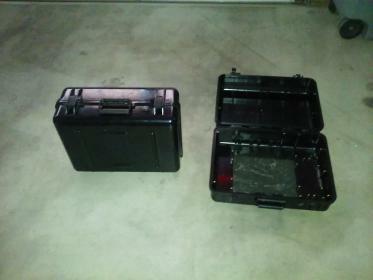 They're old military surplus cases designed for specific tasks, so I had to gut the insides out a bit. These might work on some Givi racks with a little MacGyvering. 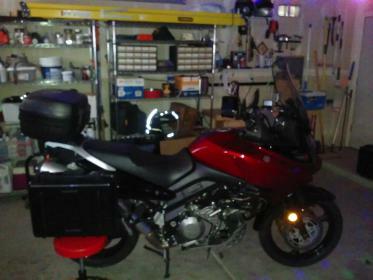 I'm buying Givi racks because I'll eventually get some small 22 Liter side bags. I'm retired on Social Security so I have to pace my spending. What do you think? notacop and roostabunny like this. Looks good! So that's what the red looks like when it's shiny. Good Job they look great!!! Is there an O-ring between the case and the door to keep the water out? Yes, an O-ring and these things are pretty tight despite the IP55 rating - and super strong. Really a nice case for the money. So far I have shot them with a pressure washer and only a small droplet got in from a hole that I mistakingly widened with a bad measurement. Other than that, no water inside. It’s also pollen season here and there is no nasty yellow powder inside the cases but plenty on the black paint. I have also yanked on them with everything I’ve got and almost pulled the bike on me, but the cases didn’t budge. I’m still going to work on a quick release idea but I’m pretty happy with this $50 set up.... for now. And yes, please post a pic of how you mounted yours.